40GBASE QSFP+ to eight LC/SC/ST/FC Connector Breakout Active Optical Cable are a high performance, low power consumption, long reach interconnect solution supporting 40G Ethernet, fiber channel and PCIe. It is compliant with the QSFP MSA and IEEE P802.3ba 40GBASE-SR4. QSFP+ Breakout Cable is an assembly of 4 full-duplex lanes, where each lane is capable of transmitting data at rates up to 10Gb/s, providing an aggregated rate of 40Gb/s. QSFP+ Breakout Cable are suitable for short distances and offer a highly cost-effective way to connect within racks and across adjacent racks. This product is a high data rate parallel active optical cable (AOC), to overcome the bandwidth limitation of traditional copper cable. All our 40GBASE QSFP+ to LC/SC/ST/FC Connector(8) Breakout Active Optical Cable are 100% compatible with major brands like Cisco, Juniper, Enterasys, Extreme, H3C and so on. 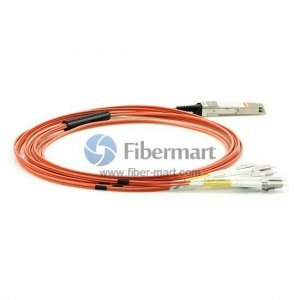 If you would like to order high quality compatible 40GBASE QSFP+ to LC Connector(8) Breakout Active Optical Cable and get worldwide delivery, we believe Fiber-mart.COM is your best choice. SFF-8436 QSFP+ compliant housing and hot pluggable electrical interface. Custom 40GBASE QSFP+ to LC/SC/ST/FC Connector(8) Breakout Active Optical Cable are available in various lengths and other options. X means LC,SC,ST or FC Connector. Works well, doesn't disappoint. Just the way I like all of my casual and spontaneous interactions. Fast and easy. is it possible to make the cable up to 50 meters? we need long distance from 40G to 10G, pls help to [email protected] thank you! the cable works good with our switch, will but it again when we need. thank you for your business! The cable was easy to plug in and set up. Build quality is good and the male pin makes a firm connection to the optical in, will buy again if need. Excellent company. Quality Active Cable! Good! Delivery timescale exceptional. Would certainly use again.